Book 1 – Walking Bass Lines for Guitar – The Blues in 12 keys The Blues in 12 Keys – Walking Bass Lines for Guitar Book I The Blues in 12 Keys is a complete guide for the guitarist demonstrating the devices used to play walking bass lines and chords in solo or accompaniment settings. Including Bebop Blues progression, Minor Blues & Blues with a Bridge, 3 note shell voicings, Chord inversions, Chromatic approach notes, Voice leading, Triads, 7th chords, Harmonic anticipation, Pedal points, Turnarounds, Tri tone substitution. Part 1. Demonstrates the various techniques used to provide forward motion into bass lines and outlines comping patterns to build a fluid walking bass style for all musical situations. The exercises build in a stepwise manner and are designed to give the guitarist a solid foundation in the walking bass style incorporating 3 note shell voicings. Part 2. Expands on the lessons and techniques used in Part 1 providing the guitarist with 60 choruses of examples written out in all 12 keys covering the Jazz & Bebop blues progressions. Part 3. Blues with a Bridge in 12 keys – Classic blues form of AABA 3 choruses of Blues with a Rhythm Changes bridge. Completely notated with walking bass lines and shell voicings. Part 4. Minor Blues in 12 keys – includes 24 choruses of notated examples of Minor Blues walking bass lines and shell voicings. All examples are shown in Guitar Tab and Standard notation. Includes MP3 playalong . Walking bass line Masters. Next time your listening to your favorite bass player walk bass lines, take the time to really tune into the finer details. How are they outlining the ii V progression, or the turnaround, or how are they setting up the top of the tune as the soloists change over? 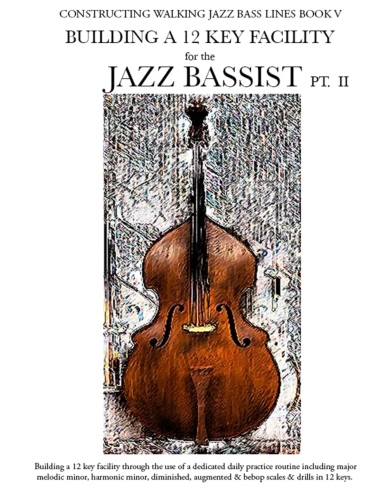 Jazz bass books are now in stock.